Discussion in 'Reign of Winter' started by Statboy, Nov 8, 2017. Every century Baba Yaga returns from her endless wanderings amongst the planes to place a new daughter in charge of Irrisen. For 100 years Queen Elvanna has reigned over Irrisen, but she is not content to go meekly with the Mother of Witches. Something has happened, the Witch Queen has been opening winter portals all over Golarion and has even somehow managed to trap Baba Yaga's dancing hut which she now keeps on display in Whitethrone, the capital of Irrisen. Baba Yaga is nowhere to be seen, perhaps she is simply late. You have found yourself close to one of these portals when it opened. In the country of Taldor, near the village of Heldren, in the middle of the summer the portal has brought snow and winter. Worse yet, strange wintery creatures have been seen in the Borderwood, and have even abducted a Taldan noblewoman. For the love of adventure and gold (and because Chew An is a good person) you braved the now wintery Borderwood to save the Lady Argetenea Malassene. You encountered a few undead, and a few creatures not native to the Borderwood before eventually reaching the High Sentinel Lodge. Unfortunately the High Sentinels are dead and their lodge is now occupied by a group of bandits known as Rhokars Raiders, who are under the command of Rhokar Cindren, a ranger who doesn't cast ranger spells, has a wizards spell book, and wears an unholy symbol. As expected from a party with two barbarians you just killed everyone that looked evil, and looted the place for anything that could be sold. You did manage to find Lady Malassene locked in the basement and returned her to Heldren safely. Lady Malassene informed the party that, what you now know is the winter portal, is under the command of a Moss Troll named Teb Knotten and and Ice Mephit named Izoze. You journeyed deeper into the Borderwood to find and close the portal. Along the way you encountered a very odd hut shaped vaguely like Baba Yaga's dancing hut. Outside of the hut was the spirit of a young girl probably 6-8 years old. Who shouted odd statements such as "I'm sorry! Don't hurt me! I never meant to call you names!" and "I don't want your stupid doll! I want to go home! Take me back!". Inside the hut was a doll that looked similar to the spirit of the little girl. The doll went full chucky and tried to murder the party so you burned the doll with fire, then burned her hut down, and Moon Moon probably even pissed on the remains. Deeper and deeper into the wood you went. Until deafeated Izoze who tried to stop you from reaching the portal. Then Teb Knotten and the rest of his crew were sliced, chomped, and burned. Though your celebration from the victory was short lived as Black Midnight, harbinger and herald to Baba Yaga strode through the portal. But he was seriously wounded, and rather than kill you, he asked for your help. He told you of Queen Elvanna's plans to conquer all of Golarion using these winter portals, and that only Baba Yaga was strong enough to stop her. He said that the portal went to the Hoarwood in Irrisen close to the pale tower, a regional seat of power. The Pale Tower is home to the governor of the area, the White Witch Nahvena Vasilliovna, and her second in command Radosek Pavril. You agree'd to help find Baba Yaga and put an end to Queen Elvanna. The black rider told you, that you need Baba Yaga's Dancing Hut to find her, and that he had two keys that could control the hut. He then cut his own throat, drenching the keys in his blood and reactivating their power. But something else happened, the blood reached out to each of you. Why isn't it next Tuesday. With the new found power of the Black Rider beginning to manifest in each of you, you bravely jump through the Ice Portal into the land of Irrisen. Rather quickly you find some locals in peril, upon saving them you meet and befriend the lovely Nadya Petska. She gives you food and shelter in the nearby town of Waldsby, and you divulge your plans to close the Ice Portal. Having lost a daughter to the White Witch Nazhena Vasillionva, who opened the Ice Portal, she wished to help you depose her rule. Three times you met spies working for the Pale Tower, and all three times you killed them before they could send word back, guaranteeing that you could assail the Pale Tower unaware. And so you did. For two days you fought your way up the Pale Tower, until you reached its heart were the Ice Portal's magic was emanating. But Nazhena was not there, instead you found her right hand Witch Radosek Pavril. In a quick nearly bloodless fight you felled the Winter Witch and free'd Waldsby from the Pale Towers tyrannical rule. One thing was left, closing the Ice Portal. The Wizard Ates Olum rolled up his sleeves studied the magic and with a swish and flick, closed the portal, and saved Taldor. But according to the readings in the Pale Tower, more Ice Portals were present popping up all over Golarion. From somewhere deep inside, came a tugging in your gut, urging you onward to Whitethrone, the Capital of Irrisen. Where you know Baba Yaga's hut has been captured by Queen Elvanna. "Baba Yaga is the only one strong enough to stop Queen Elvanna" the Black Riders words echo in your memories. So the party begins its journey to Whitethrone to free Baba Yaga's hut so it can find her. What if we skip this and go kill that witch queen lady di-rectly? With Nadya and her children in tow, the party crosses the snow bound plains of Irrisen straight into the home city of Queen Elvanna. While tracking down the hut, something else happens, only partly intentioned by the party. They begin a revolution. In an attempt to find Nadya's uncle, Ringeirr Malenkov, they accidently free'd a small fishing village from its oppressionist leader. Ringeirr explained that he wasn't quite a simple fisherman, but rather, an agent of Milani working for The Heralds of Summer's Return. The Heralds objectives are to overthrow the white witches and return Irrisen into the control of the Linnorm Kingdoms. Once free'd the fishing village agreed to aid the Heralds but knew they didn't have the strength to oppose the white witches themselves. With the help of the *ahem* always useful Ringeirr the party is smuggled into Whitethrone and into a secret temple to Milani, to meet with Solveig Ayrdahl, the high priestess of Milani for the Heralds. Solveig explains that the Hut was shackled in the Merchants Quarter as a testament to Queen Elvanna's power, but something went wrong. The Hut still defends itself, and it threw up a forest around itself, bringing with it terrible creatures from the first world. Queen Elvanna even dispatched her Great-Great-Granddaughter Nahzena Vasilliovna to encircle the forest and fight back against the hut. The party wouldn't be able to get to the Dancing Hut without fighting their way through an entire army, or at the very least giving that army a bigger threat to face. Which is exactly what Solveig proposed to do. 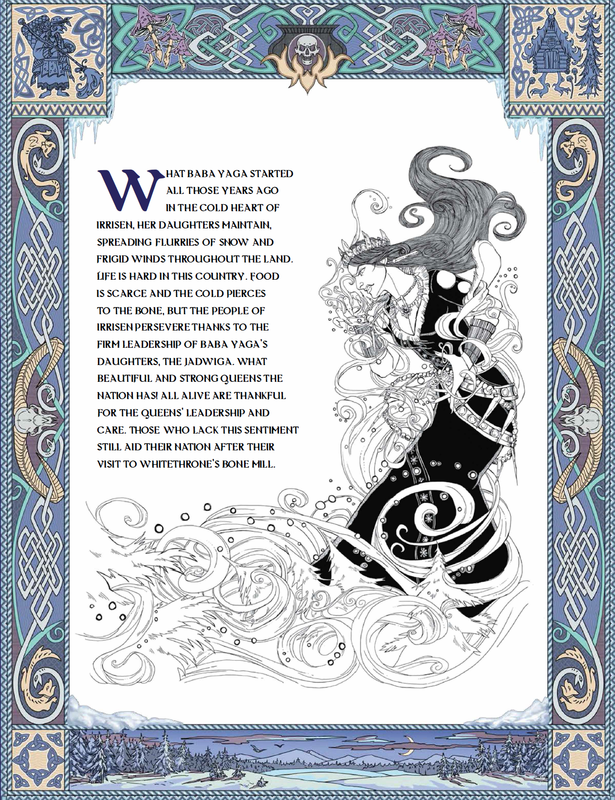 She explained that when Elvanna initiated her plan for total Golarion conquest, she fired the old Iron Guard (traditionally the queen's army) because they were still loyal to Baba Yaga, replacing them with her own Winter Guard. The Iron Guard didn't go away however, they were just waiting for the opportune moment to attack. All the party had to do was assault the well guarded home of the Winter Guards commander in Whitethrone. 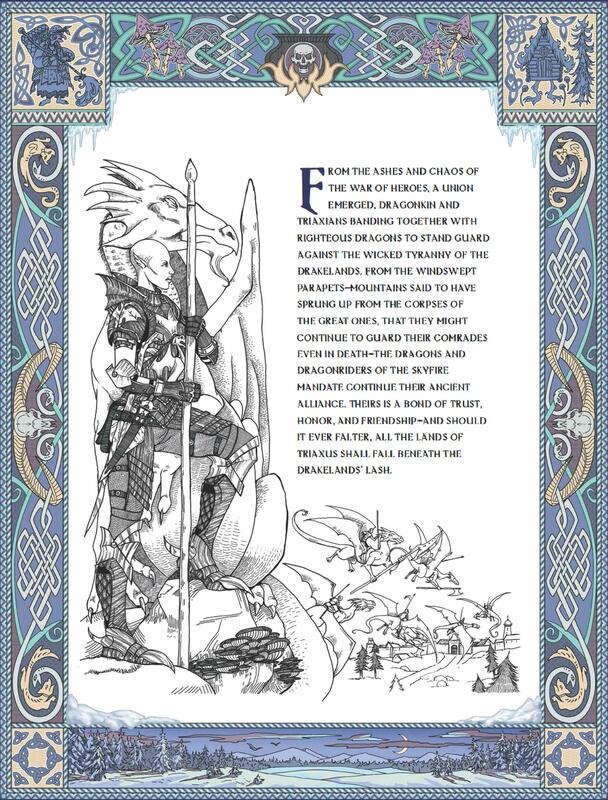 The commander, was also a White Dragon named Logrivich. With a little trepidation, but also gladness to have a foe to fight again, the party assaulted Logrivich's clock tower home. Killing the White Dragon quickly and decisively. Solveig signaled for the uprising to begin, and the entire city was plunged into civil war as the Iron Guard and the Heralds of Summers Return came spilling forth to attack the Winter Guard and the White Witches. The march to the merchants quarter was simple, with the civil war going, nobody had time to look twice at people minding their own business. Once at the newly forested merchants quarter things became more difficult. With remnants of Nazhena's army still inside, along with powerful first world creatures, the fight to the Dancing Hut proved difficult. What's worse once they reached the Hut, none other than Nazhena herself was guarding it. She also proved herself a powerful foe, but the party prevailed against all these terrible odds, not stopping until Nazhena's legs had been removed and her lifeless naked corpse was impaled upon the bone fence surrounding the hut. Now the Dancing Hut of Baba Yaga loomed over the party. Eventually the Wizard Ates, the physically weakest party member, got up the courage to approach the Hut. But the Hut did not attack the party, rather it sat down to allow the party entrance. Inside the Hut was much larger than it appeared, and the party was greeted by a grumpy servant of Baba Yaga who coerced the party into proving themselves true agents of Baba Yaga, by disposing of one of Nahzenas traps. This nearly cost the lives of half the party, but the party eventually prevailed. All that was left was to search the Hut for information or valuable artifacts that might help them on their journey. But the Wizard Ates, once again acted and immediately activated the keys to the Hut, that the Black Rider had given them. The Hut shimmered and the room changed, and the party found themselves in a new room they had not been to before. Though in possession of Baba Yaga's dancing Hut, they were now at an impasse, they don't have clear direction as to what to do next. They only knew they needed the Hut to find Baba Yaga, but what comes next? Exploring the new layout of the Hut our champions of Golarion are greeted by 3 black crows. Though these crows are far more intelligent than the average animal. They test the PC's Strength, Intelligence, and Wisdom. After passing each test, the crows give them clues as to what Baba Yaga wants them to do. The PC's correctly deduce that they need to go to Artrosa and find something to do with a Dragon and Gold. 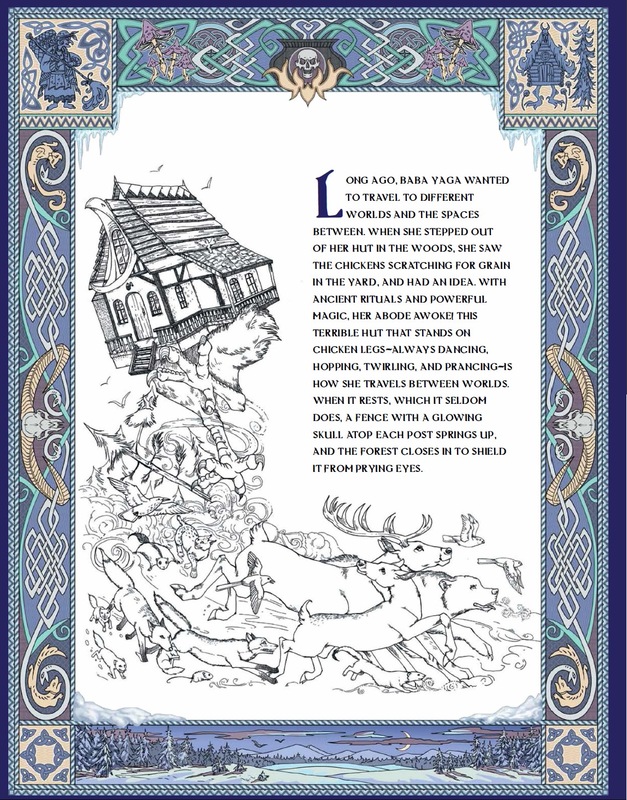 So off they go to the Baba Yaga's ancient stronghold of Artrosa located in Iobarria, luckily for them once they leave the Dancing Hut they find themselves not only in Iobarria but relatively close to Artrosa. Though they have little enough time to celebrate this as the Hut is immediately besieged by a small army of frost giants. Though not strong enough to attack that many frost giants themselves, the party finds aid in the form of the Hut itself, which proceeds to attack the frost giants turning the tide in the parties favor. So off into the forest they go, quickly stumbling upon a Centaur Clan. By being honest with the Centaur's and helping defend the clan when a group of Andrazku Demonic Fey attack, the party earns the trust of the Centaur's. Who not only grant them passage through the land, but also provide a guide name Ardija, a lovely young Centaur Ranger with wild brown hair and a chestnut coat who has seen less than 20 winters. Erdija leads the party straight to Artrosa a massive cliff half a mile tall between the party and the entrance. At the base Erdija finds footprints of Centaur's and Frost Giant's, and concludes that Vsevolod must be here already. 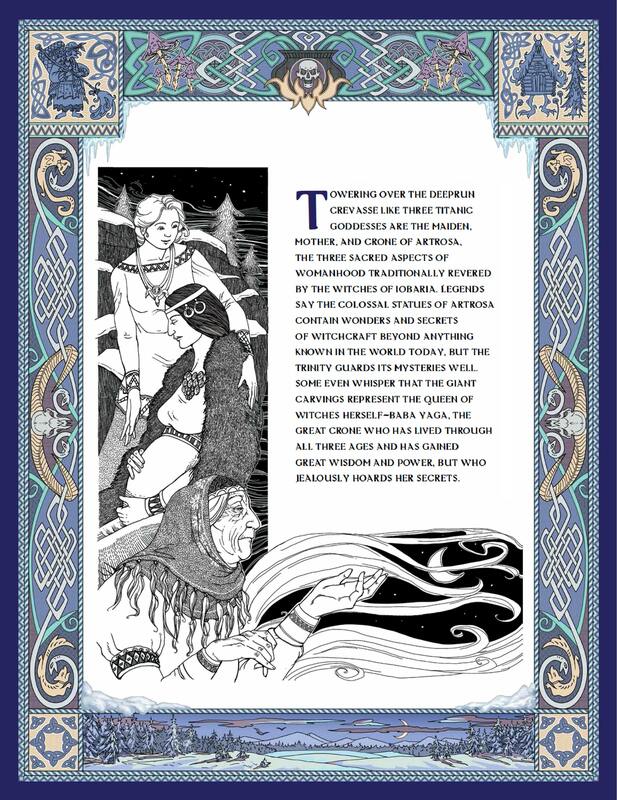 She explains that Vsevolod worships Kostchtchie the demon lord who warred with and lost to Baba Yaga. Erdija hints that she would like to accompany the party inside and help them, if they could find a way to get a Centaur to the top of the cliff. The party gives this little thought, as they struggle to figure a way to get themselves to the top. The climb does not go well, the party splits in two, with the two wolves Sun Sun and Moon Moon accompanying the Wizard Ates and the Cavelier Zeep. Using magic they quickly outpace the rest of the party and are unable to defend themselves against two will-o-wisps. Only Sun Sun survived the fall that followed. The rest of the party seeing there comrades fall back past them to the ground descend to bury the dead and plan a new approach. While conversing with Erdija, who had stayed behind at the bottom, two new people find the party. An oracle name Kivuli, and a Witch named Memsie, who had been sent by the White Rider of Baba Yaga. Erdija having a deep mistrust of witches proceeds to challenge Memsie, who confirms every bad thing Erdija thinks about Witches by slinging spells at her, and toying with her. With the help of the new party members, the party is eventually able to enter Artrosa. Inside Artrosa they find things have gone a bit wonky. The fortress is usually home to the Coven of the Warden of Atrosa, and a select group of defenders meant to test anyone who would claim its treasures. Though now the fortress also has the followers of Kostchtchie inside, and the Wardens Coven has splintered fighting with itself. 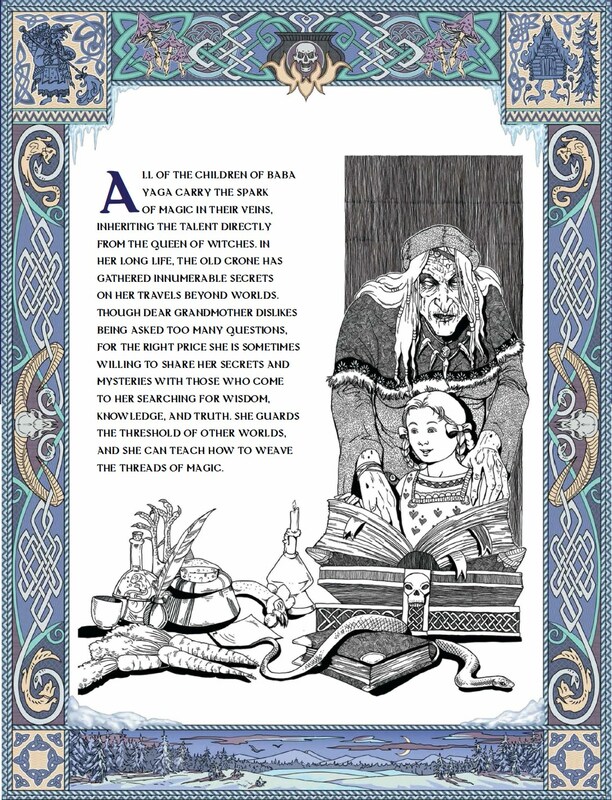 Baba Yaga's chosen warden Jadrenka, is betrayed by her mother Caigreal who wishes to control Artrosa for herself, what's worse Caigreal cares little who wins between Baba Yaga and Kostchtchie, and is willing to help Vsevolod to use Artrosa to resurrect Kostchtchie. Fighting their way through all comers, talking little and asking few questions, the party devestates the inhabitants of Artrosa leaving only Jadrenka, her former lover Marislova (Marislan), and Nostafa alive. Losing even one of there own, the Barbarian Chew An. Though they find a new ally in the form of a captured test subject, the Fighter Krom. Eventually making it to the heart of Artrosa, the party defeats Vsevolod, but loses Sun Sun in the fight. Before descending into the Eon Pit and finding the Dragon Scale that Baba Yaga had left behind. With the dragon scale, Jadrenka hands them the other object left by Baba Yaga, a golden nugget and confirms what the party had figured out, that the objects are keys to follow Baba Yaga to her next location. Where Jadrenka claims Baba Yaga needed to "perform maintenance on her Winter Portals". Not knowing where they will end up, the party begins the journey back to the Hut, to travel to its next location. As the Dancing Hut travels once again through space, the party of intrepid hero's wonders where they will end up. In a gazebo in a sunny meadow was not what they expected, and they could scarce believe their luck. Until they realized they were still in the Hut and everything here was still trying to kill them. The team eventually makes it outside and see tree's and plant's they've never seen before, a darkened sky due to a tiny sun, and most disturbing a Red Dragon killing a Blue Dragon before noticing the party and descending towards them. But once again things are not what they seem, the Dragon is actually a dragonkin with a dragon rider. These two alien beings, Beyscalie and Efrixes, tell the party they are on a planet called Triaxus. Triaxus a planet with far more dragons than Golarion, has begun a descent into civil war after the dragon's attacked the Dragon Legion. Too bad the party cares little for local politics, especially those of a distant alien planet. So the party returns to the Dancing Hut. The Hut had other ideas however, and immediately give the party new breadcrumbs from Baba Yaga to follow. These breadcrumbs would take the party straight into the Dragonwar. Baba Yaga's servants give the party a piece of unusual news as well. That Baba Yaga is "Off to see her only son". Having read Baba Yaga's genealogy book you recall that no mention of a son is ever made. You have little time to worry about such matters however as the first key to follow Baba Yaga is in the middle of the besieged fortress Spurhorn. A minor siege is no issue to our hero's however as they nearly single handedly break the siege and kill the enemy's General, Malesinder. One key down and one to go the team prepares to travel across the country to Ivoryglass, the home of the second key, and the Dragon lord who launched the attack against the Dragon Legion. Getting to Ivoryglass gives the party pause, and nearly everyone dies following a Wolf Shaman into a glacier looking for a side entrance to Ivoryglass. Ivoryglass itself posed little issue for the party as its owner, Yrax Lord of the Howling Storm, rather hates company and fills his castle with mindless golems and prisoners he calls his treasures. The prisoner's don't hardly deign to slow the PC's while the golems are little more than canon fodder. Yrax himself posed the most difficult fight of Ivoryglasses inhabitants, but was eventually disposed of himself. Helping themselves to the second key that Baba Yaga left (and everything else in the treasury) the party picks up a new friend and heads back to the Hut, which proved to be an easy endevour as the Hut had teleported itself into Yrax's throne room as soon as the party found the second key. Now they must follow Baba Yaga's path, and find her son.